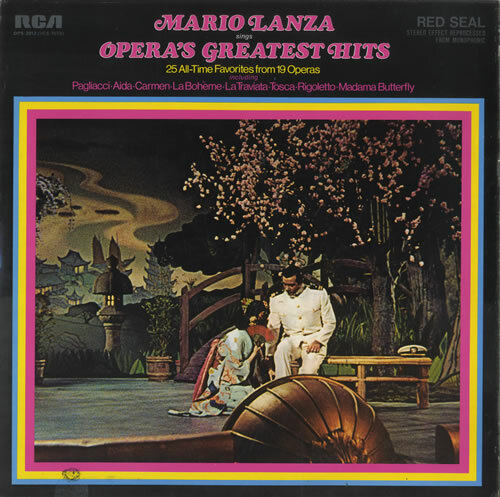 "Vogliatemi Bene" from Madama Butterfly, with Frances Yeend, soprano. Hollywood Bowl concert, 28 August 1947. Eugene Ormandy, conducting. 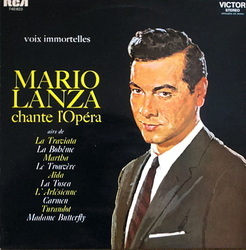 (Above) This audio recording is accompanied by images of Lanza and Yeend with fellow Bel Canto Trio member George London in 1947, photos of Lanza with Tomiko Kanazawa (his Butterfly at the New Orleans Opera in 1948), assorted pics of Lanza at the Hollywood Bowl in 1947 and 1948, and a few frames from the Madama Butterfly scene with Kathryn Grayson in The Toast of New Orleans (1950). (7:26) --Courtesy of Vincent Di Placido. Where more than one version of a particular aria or duet exists, I've identified what I consider the best rendition(s) in bold. Roll over this bold text to locate the CD with the best reproduction of that recording. Where only one rendition exists, I've also identified the optimum CD source. (Again, simply scroll over the text with your mouse to locate these details.) 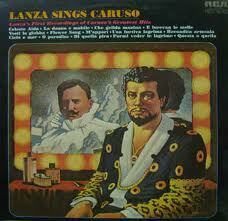 Bear in mind, however, that not all of Lanza's operatic recordings are available on CD. Some are soundtrack recordings, for example, that are unlikely to be released commercially. 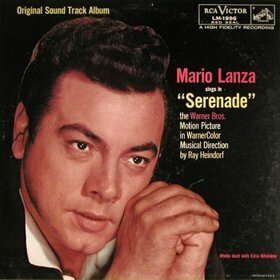 While SonyBMG has yet to release a CD comprising the best of Lanza's commercial operatic recordings, as a starting point the hard-to-find 2-CD set Mario Lanza: Encore! (BMG/Harvest Music, 1999) is highly recommended (even secondhand, which is probably the only viable option these days) for its excellent sound and generally well-chosen selection of arias (together with some fine recordings of Italian and Neapolitan songs). The easier-to-find but uneven Mario Lanza: Opera Arias and Duets (BMG, 1999) also features some excellent material. (Click on these titles for my Amazon reviews.) 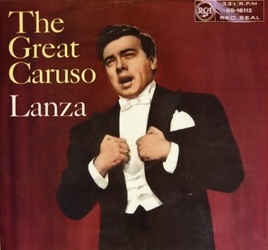 There is relatively little overlapping between these two collections, with different versions of most of the arias that appear on both compilations. For Lanza's live operatic performances, the CD accompanying the second (2008) edition of Armando Cesari's biography Mario Lanza: An American Tragedy is by far the best compilation, and includes three Hollywood Bowl appearances (1947-49), operatic selections from a 1948 concert in Toronto, and some fascinating private recordings. Bada, Santuzza, Schiavo Non Son! 1950 with Dorothy Kirsten, soprano, Giuseppe Valdengo, baritone, and Blanche Thebom, soprano for soundtrack of The Great Caruso; Peter Herman Adler, conductor.